Pictured above: A white shark with a prototype of the shark camera attached to its dorsal fin. White sharks reside along the coast of central and northern California where abundant populations of seals provide a rich and ready source of food. Why the sharks would ever leave this highly productive home range is a mystery. 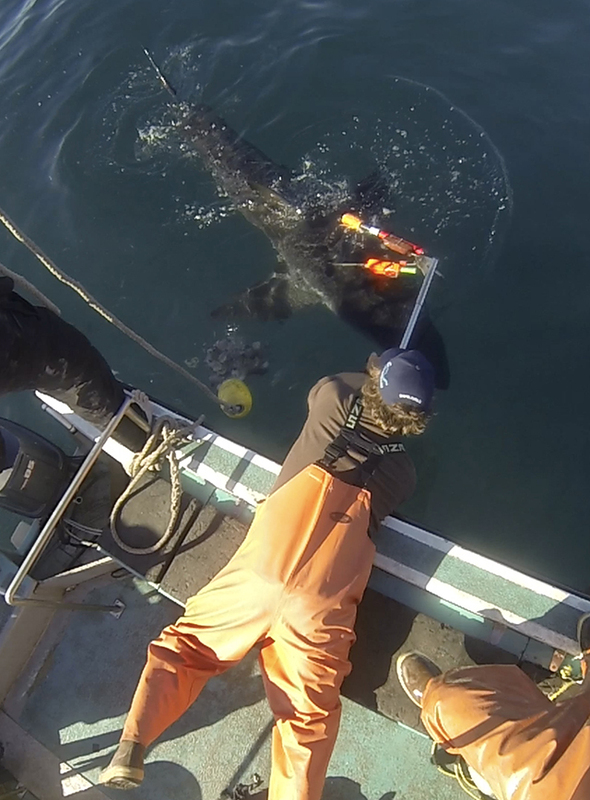 Electronic tags placed on California white sharks by scientists from the Monterey Bay Aquarium and Stanford University record their movements and the depths they occupy. At a pre-set time, the tags pop-off the sharks, float to the surface and send a signal to satellites where their records can be retrieved. To the surprise of nearly everyone, pop-up tag data revealed that in winter the sharks turn seaward, traveling southwest to a region of the central Pacific roughly midway between Hawaii and the Baja Peninsula. The area where the sharks congregate was nicknamed the White Shark Café. After spending several weeks in the Café region where they will dive up to 150 times a day down past 200 meters (700 feet) deep, the sharks return to their coastal range. The big question following this discovery is, why? Learning why sharks take a long and arduous journey every year to the same open-ocean location provides clues to the health of these top ocean predators, which in turn is related to the health of the ocean. The central gyre of the North Pacific has long been regarded as an oceanic desert. Decades of observations from satellites scanning the surface waters for chlorophyll indicated that the Café region was an area of low productivity, nothing like the rich coastal waters of the sharks’ coastal range. This notion made the annual shark migration just that much more mysterious: what could be the point of that long round-trip if there was not much to eat once the sharks arrived? MBARI has played two important roles in the research into shark behavior: Scientist Bruce Robison participated in an expedition to the White Shark Café, bringing his expertise in using remotely operated vehicles (ROVs) in midwater research. In a concurrent effort, Engineers Thom Maughan and Larry Bird designed systems to attach cameras with sensors to shark fins so that the Monterey Bay Aquarium could study their behaviors. The engineering effort began in partnership with the Monterey Bay Aquarium, where Salvador Jorgensen, a senior research scientist, was conducting research into the travel patterns and behavior of white sharks. He asked for MBARI engineering assistance in creating camera packages that could be attached to sharks to record their actions. Over the course of several years, Maughan and Bird designed a lightweight titanium housing for a low-light camera, with a clamp to attach the package to a shark’s fin and a programmable release to allow the package to float to the surface. The release system is a critical component that enables the detachment of the clamp from the shark at a preprogrammed time and date, which is essential for recovery of the camera. Maughan designed and built an electronic “hot knife” that burns through a braided line. This function is setup and tested via wireless radio communications. Once severed, the line activates a titanium spring that disengages the clamp mechanism, all developed by Bird. The timed-release system has many potential uses and has already drawn interest from other biologists studying sharks and sea turtles. Every part of the clamp and housing for a small camera to be attached to a shark’s fin had to be specially designed and built at MBARI. The metal pieces are all made of titanium and were machined by Mechanical Engineer Larry Bird. Photo by Todd Walsh. This “Shark Café Cam,” as they called it, also needed some form of communication so the researchers would know where to retrieve it once it released from the shark’s back. The ultimate goal was to use these cameras to observe the behavior of the sharks on their annual migration to the White Shark Café. From pop-up tags used previously in the aquarium shark research program, the team knew the camera tag would need to survive depths to 1,000 meters and transit times of as long as four months as the sharks traveled from Northern California to the Café. But the success rate for retrieving the pop-up tags was less than 15 percent. It was imperative that most of the new camera tags make it back to scientists on the California coast so they could retrieve the recorded video. The MBARI and aquarium team chose to design a camera tag that would attach to the shark’s fin instead of the more common animal-tagging method that involved shooting a dart into the animal because Jorgensen found that he got better video from the stability of firm attachment to the shark’s fin. Bird took on the design of a clamp to attach to the fin, over time making it lighter and smaller to minimize the impact on the animal. 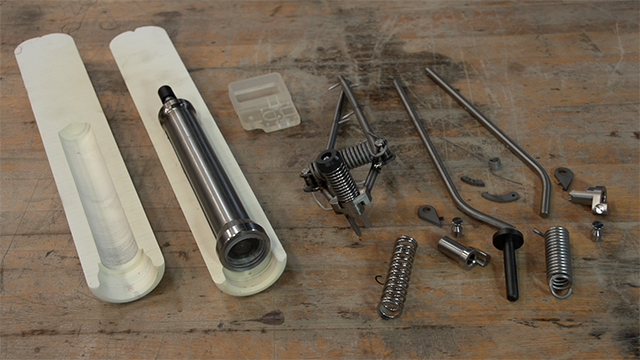 The entire clamp-and-release mechanism was designed and built at MBARI. Sal Jorgensen, a research scientist at the Monterey Bay Aquarium, attaches a prototype video camera tag developed in collaboration with MBARI engineers to the dorsal fin of an adult white shark. Photo courtesy of the Monterey Bay Aquarium. The camera controller, wireless power charging, solar harvesting, and sensor logging electronics and software were designed at MBARI. The solar-energy harvesting capability was added to power a satellite radio to transmit the camera location when it is at the surface to help facilitate its recovery. The sensor controller software also had an important animal behavior detection feature that makes the camera “smart” about when to turn on autonomously at the right time and place in the shark’s journey to capture what is most interesting to science. The team also designed a system for the scientist to write the behavior-detection algorithm that would then be translated into the programming language on the microprocessor embedded in the animal tag. This workflow puts the scientist in the driver’s seat without the obstacle of learning embedded system computer programming and is considered a significant advance in systems-engineering workflow. The team also designed a pressure-tolerant foam enclosure for the entire camera package so that it will float once released. The design elements of the Shark Café Cam have been picked up by commercial animal-tagging companies, and the MBARI team is preparing to post as open source the procedures, mechanical and electronic designs, and software for use by others in the ocean research community. An early shark café camera prototype was tested in South Africa, and the most refined version has now been successfully used at the Farallon Islands off the coast of San Francisco, where white sharks are known to congregate. The cameras have returned enough video to provide the aquarium research program with significant insights into shark behavior, such as foraging in kelp forests. Scientist Sal Jorgensen and Engineers Thom Maughan and Larry Bird explain the development of shark camera tags. Looking over the shoulder of MBARI Scientist Bruce Robison during a dive with remotely operated vehicle *SuBastian* at the White Shark Café, as he examines a *Histioteuthis* squid. Photo courtesy of the Schmidt Ocean Institute. Although the new shark camera tags have not yet been sent to the White Shark Café, MBARI has already made an important contribution to the understanding of the mysterious place where the sharks congregate. Last spring an expedition set out aboard the Schmidt Ocean Institute’s (SOI) vessel Falkor to find out more about shark migration. Sailing from Honolulu, the ship headed to the Café region with its arrival set to occur at just about the time that the pop-up tags, placed on sharks the previous winter, were set to release and rise to the surface. Once a tag surfaced and was recovered, indicating a shark was close by, a broad range of investigations was begun to characterize the oceanography of the site, a pattern repeated again and again as more tags surfaced. 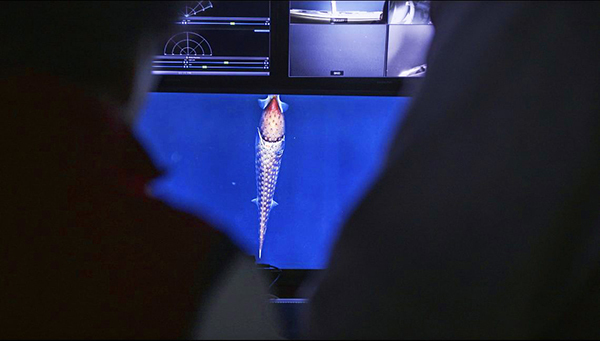 MBARI Midwater Ecologist Bruce Robison joined the Falkor expedition with the goal of examining the animals in the Café water column, to see what the potential food resources of this supposed “desert” region might be. This was the first time that this part of the ocean had ever been studied with an undersea vehicle. SOI’s deep-diving ROV SuBastian was used to conduct the surveys, with methods refined at MBARI. MBARI’s midwater research program is the gold standard for such operations and the survey and exploration techniques developed in Monterey Bay were applied to the midwater community of the Café. Observations of the Café’s community composition, food web structure, and vertical distribution are being compared with the reference community in Monterey Bay. MBARI’s midwater research program is the gold standard for such operations and the survey and exploration techniques developed in Monterey Bay were applied to the midwater community of the Café. Observations of the Café’s community composition, food web structure, and vertical distribution are being compared with the reference community in Monterey Bay. Additional data on the water column fauna were gathered with traditional net tows and acoustic surveys using the ship’s echosounder. Hydrographic profiles of temperature, oxygen, chlorophyll, and salinity were generated using standard instrument hydrowire casts. The picture of the midwater community that emerged from these efforts is far from what was expected—instead of a desert, the ROV dives revealed an oasis full of fishes, squids, crustaceans, and a broad range of gelatinous animals. The question of why the region appears to have such low productivity in the satellite imagery, was resolved when it was found that the depth of maximum chlorophyll concentration was far deeper than can be readily detected by satellite-borne sensors. And instead of a soupy mix of phytoplankton (tiny marine plants) near the surface, the phytoplankton population was dominated by subsurface clusters of diatoms that formed clumped mats, a rich source of food that supports the abundance of life found at the Café. Another significant discovery made during the ROV dives was the presence of populations of three squid species that comprise a food web more than adequate to provide a major food source for the sharks and other large pelagic fishes that visit the Café region. Largest and deepest-living of the three squids is Ommastrephes bartrami, the neon flying squid, with a population in this region large enough to support a commercial fishery. Sthenoteuthis oualaniensis, the purpleback squid, is a squid of intermediate size and a likely prey item for O. bartrami. The third species, Hyaloteuthis pelagica, also known as the glassy flying squid, is relatively small, lives nearer the surface and is likely preyed upon by the other two species. 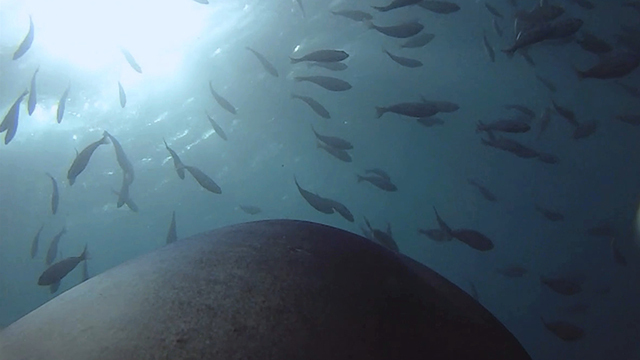 The deep sea from the point of view of a shark. This image was taken with a prototype of the shark camera developed by MBARI and the Monterey Bay Aquarium. Photo courtesy of Monterey Bay Aquarium. The squids are central elements of a food chain that includes small crustacean grazers and very small fishes near the base, and large pelagic predators like tuna and sharks at the top. Free-floating egg masses from at least two squid species were commonly observed during ROV dives. This indicates that these squids are full-time residents rather than temporary visitors like the sharks. Based on these observations it now seems clear that the Café region has plenty of food to support a migrating population of several hundred sharks. While data from the expedition are still being analyzed, there is clear resolution to one of the mysteries of the White Shark Café—it is definitely not a desert. There is an abundance of food there for the migrating sharks to eat, food that they don’t get at their rich feeding grounds off California. In fact, the Café offers a change of menu! That said, the ultimate reason for the sharks’ migration still remains a mystery to be resolved.